Weaponsmith Ornifex is a Crow Demon “blacksmith” living in her workshop in Lower Brightstone Cove, Tseldora. 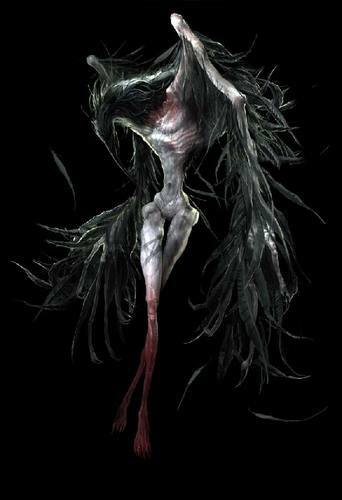 The Crow Demons were likely servants of Velka who were transfigured in their devotion. 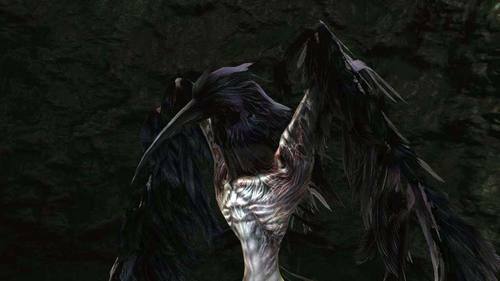 There is strong evidence that the Blades of the Darkmoon grew out of this servitude to Velka. The Crow Demons carry Souvenirs of Reprisal which are blood-drained, shrunken ears, taken from the subdued guilty. We know that Velka was the goddess of sin and punishment, and her followers likely carried that out for her. In comparison to this, the Blades of the Darkmoon seem to have taken the intention of Velka’s covenant and twisted it so that punishment is only inflicted upon those who sin against the gods, instead of any who sin, gods included. It is therefore very likely that the Crow Demons are the remnants of Velka’s covenant of punishment. It would appear that, like many of the other occupants of the Painted World of Ariamis, the Crow Demons were banished there. This seems especially probable considering the fact that Velka was unpopular among the gods of Anor Londo. However, as discussed below, it may be that they chose to live there to protect Priscilla under Velka’s orders. It is interesting to speculate on why Ornifex chose to leave her workshop. It is evident that she made her way through the Doors of Pharros into the Shaded Woods at the foot of Castle Drangleic. There she encountered the Lion Clan Warriors. When freed, in unused dialogue, she mentions how awkward it was for her to fall for such a trap. We may therefore take it that she fell through a section of rotting boards that populate the Shaded Woods area into the dungeon below, where she was promptly locked up by the Lion Clan Warriors. The door to her cell is only open-able by using the Fang Key, an item found on the body of a certain Lion Clan Warrior who has been petrified. It may therefore be that after being locked up, the ‘jail’ was infiltrated by Basilisks, perhaps following the lead of the Giant Basilisk that came to the area, and the fleeing jail keepers were turned to stone, leaving Ornifex in quite a predicament indeed. Imagine what I might create with such a powerful soul…"
Perhaps it was greed that encouraged Ornifex to leave home and make her way to Drangleic Castle in search of the king’s soul, but it is just as well she was trapped, for as we know, those seeking audience with the king are not well received. We find in Dark Souls 1 a Peculiar Doll that will allow us to enter the Painted World of Ariamis. This doll seems to have been given to Priscilla and allowed for her to be dragged in, likely in accordance with her will. This is especially interesting because in Ornifex’s shop we find the walls lined with dolls. These dolls do not exactly resemble the Peculiar Doll of Dark Souls 1, but strongly indicate Ornifex and her people, the followers of Velka, were complicit in the creation of the Painting of Ariamis. If this is the case, then it is likely that Velka herself, perhaps alongside Ariamis, created the Painted world in all likelihood to safeguard and protect Priscilla. Perhaps Velka was interested in Priscilla because of her Lifehunt ability, a unique ability that would allow her to hunt the gods who deserved her punishment. It may even have been this decision on Velka’s part to protect Priscilla that caused her to fall out of favor with the gods of Anor Londo. The dolls are also interesting in their resemblance to the Peculiar Doll because as we know, the Peculiar Doll was the ‘key’ to getting into the Painted World. It is interesting to speculate that the reason Ornifex may be collecting or creating these dolls is as a means of finding her way back ‘home’ to the Painted World if it even still exists. Alternatively they may be in her workshop because it is a custom of her people to create them, even more strongly hinting that the Crow Demons were the creators of the Peculiar Doll. If the Crow Demons were not forced into the Painted World, but instead chose to be there, then it would make sense that some of these demons either escaped or remained in the outside world. These ‘people’ are perhaps where Ornifex came from. "Thank you for helping me. I am Ornifex. I owe you some form of thanks, but have nothing for you at the moment. If it would not trouble you, could you visit my abode just down the way?" I believe that I can be of assistance if you would visit me at my home." "Oh, we meet again, kind traveller. This is my workshop. In your tongue, I believe I would be called a blacksmith. I create all manner of equipment, using an ancient technique unique to my…people. But I have a debt to you. I will craft one thing of your choice. My wares are far from ordinary. I am certain that they will please you. I require no payment this time. But you must bring me a Wondrous Soul. My technique absolutely requires it. I trust you will understand." "If you provide a Wondrous Soul, I will create one thing of your choice. I require no payment this time. It is my way of saying thanks." "Do you have a Wondrous Soul?" "Hello there. Do you have a Wondrous Soul?" "Hello there. What can I do for you?" "Come back again if you find another soul." "Come again, if it please you." "The nature of an item is greatly influenced by the soul that was used to create it. They can be tricky to use, but when wielded properly, are extremely powerful. This is what I meant by unique. These wares are not for use by ordinary folk." "It's hard to believe now, but this land was once a flourishing kingdom. Its king, Vendrick, came close to unlocking the essence of the soul. "It is said that our technique originates from a strange being that inhabited this land. A pale beast that lived long, long ago. We don't even know what exactly it was. If you find a Wondrous Soul, bring it by for me to have a look." "Do you find me strange? Skee hee. You humans are always this way. The way you glare at any unfamiliar creature. That mix of curiosity, fear, and revulsion. Oh, well. It hardly concerns me." "Skwaa!" "What are you…!" "Stop this!" "You humans are all alike…"
Thank you for helping me. How awkward…That I fell for such a trap. If it would not trouble you, could you visit my abode just down the way?